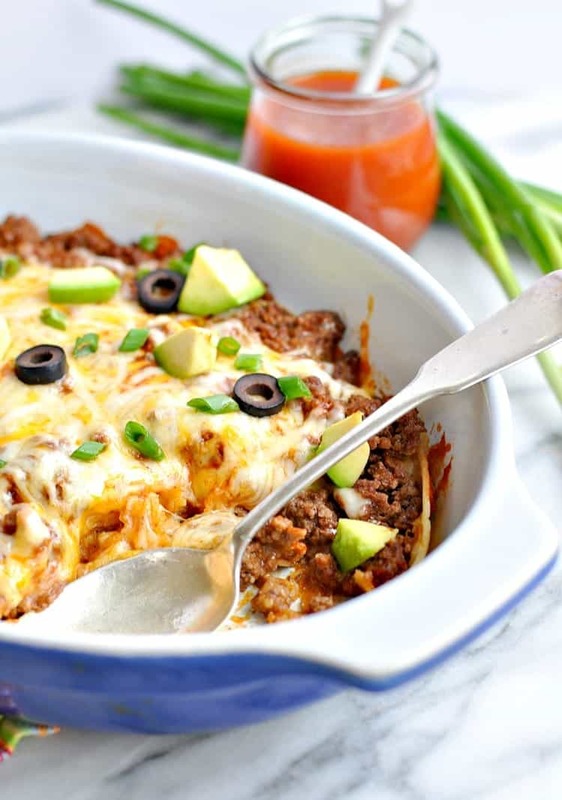 Indulge in all of your favorite Mexican flavors — guilt free — with this Healthy 4-Ingredient Enchilada Casserole! It’s a quick, easy, and family-friendly dinner recipe that’s perfect for busy weeknights! Hello, hello, friends!! I’m so glad to be visiting you again from The Seasoned Mom! Did you have a nice holiday season? Did you eat a few too many Christmas cookies and enjoy plenty of spiked eggnog? If you’re in need of a new dinner option that your family will love but that’s also kind on your waistline, then you have come to the right place! 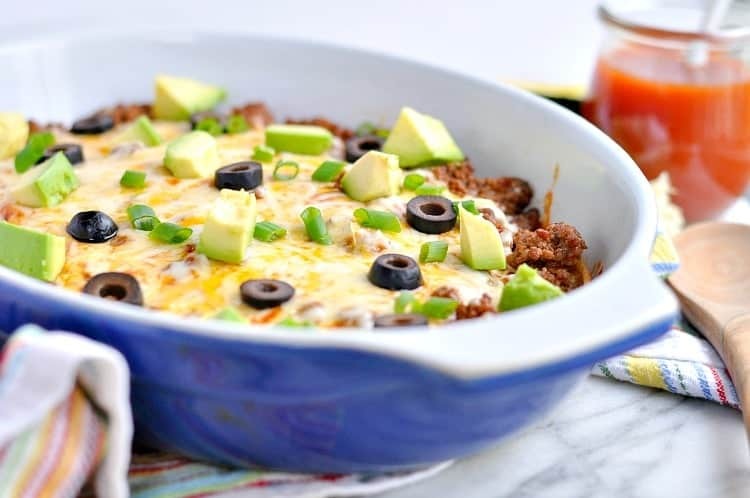 Did you ever think that you could prepare an entire casserole in about 12 minutes with just 4 basic ingredients?! I promise, it’s NOT too good to be true! 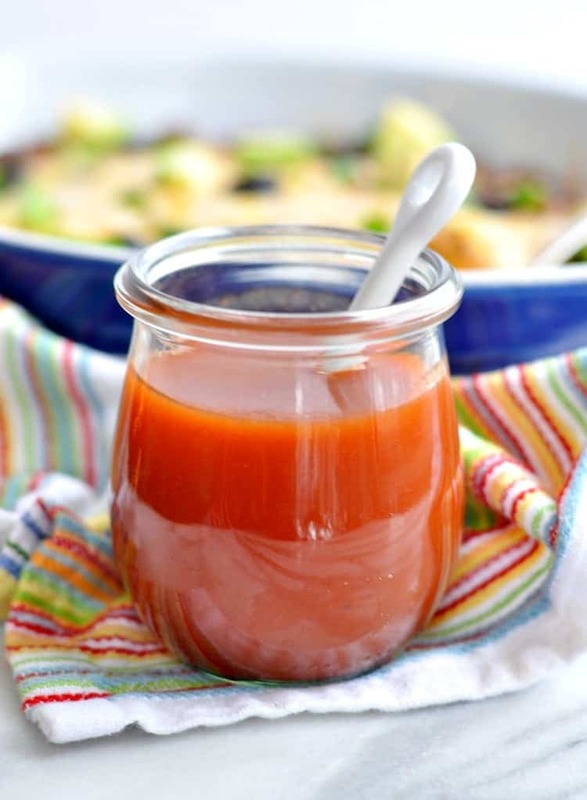 The enchilada sauce gives this dish a ton of flavor, but you can easily substitute with an equal amount of taco sauce or your favorite salsa. And while my kids like it straight out of the oven, I prefer to pile my plate high with plenty of extra toppings! I just use whatever I have on hand…avocado or guacamole, salsa, sour cream (or Greek yogurt), green onion, olives…you get the idea! Enjoy this tasty family dinner that will help you stick to those healthy living resolutions without missing out on your favorites! 1. Preheat oven to 350 degrees F. Spray a 2-quart baking dish with nonstick spray. 2. In a large skillet, cook beef until no longer pink. Drain, return to the skillet, and stir in half of the enchilada sauce (about ¾ cup) and half of the cheese (about ½ cup). 3. Place 4 of the tortillas in the bottom of the prepared dish, tearing them as necessary to cover the bottom (overlapping is fine). 4. 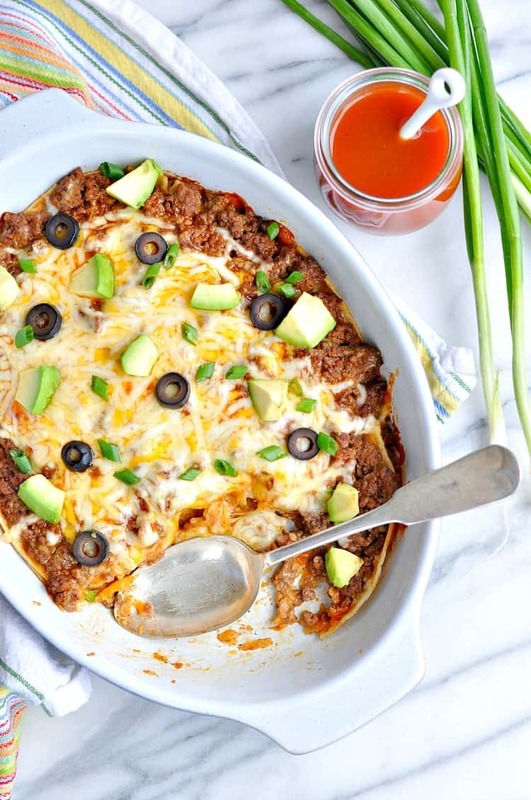 Top with half of the meat mixture and drizzle with ¼ cup of enchilada sauce. Repeat layers one more time. 5. Cover with foil and bake for 30-35 minutes, or until hot and bubbly. Uncover, sprinkle with remaining ½ cup of cheese, and bake for an additional 5-10 minutes (until cheese is melted). What are some of your favorite healthy quick-fix dinner options? Share your ideas for all of us in the comments below! And if you need even more inspiration, check out this Dump-and-Bake Skinny Chicken Parm or this Creamy One-Skillet Skinny Seafood Alfredo! Copyright © 2016 RecipeChatter. All rights reserved.